The SE&SW network represents a group of 13 states that bear a high burden of injury mortality -- with 10 of the 13 SE&SW states ranking in the worst quartile in the nation in terms of injury fatality rates. The Southeastern and Southwestern Injury Prevention Network (SE&SW IPN) is one of 5 Regional Networks created by the CDC with the goal of strengthening injury and violence prevention programs around the nation. The SE&SW IPN provides an opportunity to 1) forge partnerships among injury and violence prevention (IVP) professionals in the SE&SW region; 2) build state and regional capacity to develop strong and effective IVP programs; and 3) build collaborative networks between SE&SW IPN, CDC, Children’s Safety Network, Safe States Alliance, Society for the Advancement of Violence and Injury Research, and other key partners. The SE&SW IPN also hosts the National Peer Learning Team (NPLT) for Systems Thinking. This team supports public health professionals from diverse topic and functional areas in applying principles designed to bolster public health. The NC Injury and Violence Prevention Branch (IVPB) is the regional coordinator for the SE&SW IPN, and the IPRC has assisted IVPB with the network’s coordination since its inception in 2012, hosting the 2013 annual meeting and assisting with the coordination for all subsequent meetings. The IPRC prepares and provides legislative briefings and fact sheets to policymakers, including the NC state legislature and their staff. Fact sheets and presentations are also provided to key practitioner and advocacy groups, such as the NC Medical Board, to utilize in their efforts to support safety legislation. Additionally, the IPRC participates in “Hill Day” visits to elected federal officials. These provide an opportunity for IPRC leadership to meet with federal elected officials and/or their staff to share key information related to injury and violence prevention priorities. 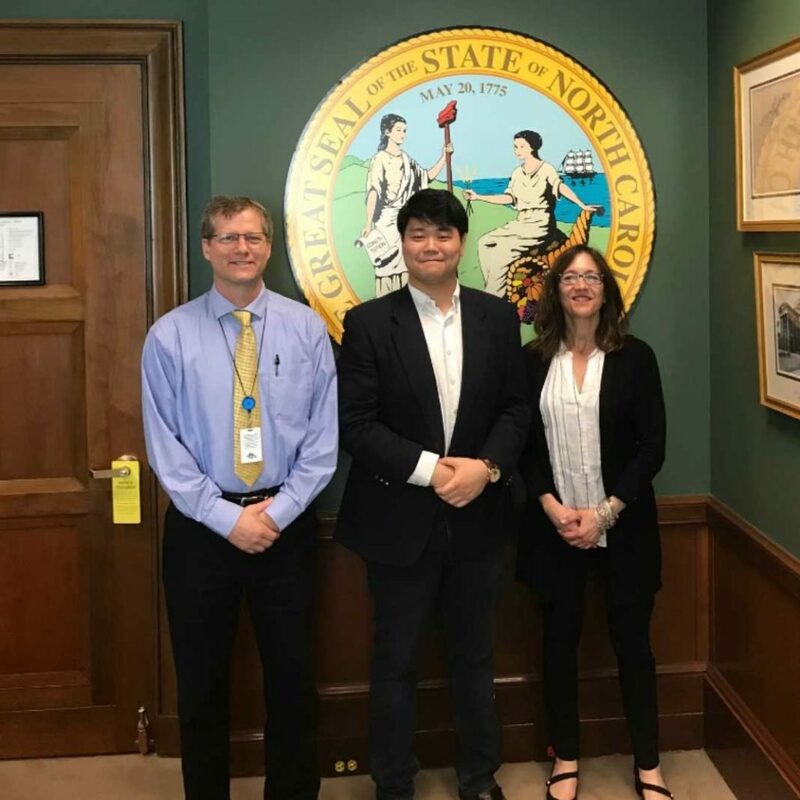 We collaborate with partners (including UNC Federal Affairs, other Injury Control Research Centers, Safe States Alliance, and the National Violence Prevention Network) in planning these visits. In 2018, the IPRC supported and attended several events on Capital Hill. The most recent of these was National Violent Death Reporting System Hill Day 2018. 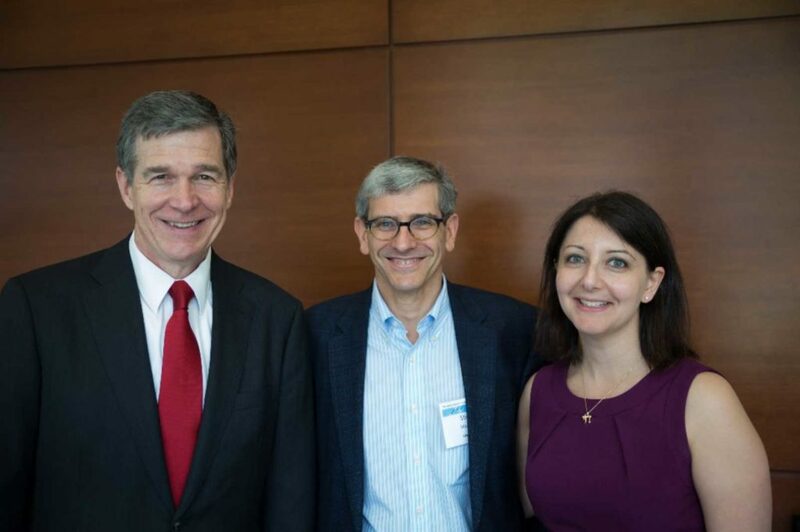 Dr. Beth Moracco (IPRC’s Associate Director) and Scott Proescholdbell, MPH (IVPB lead epidemiologist) visited with Senators Burr (R-NC) and Tillis (R-NC) and Congressmen Price (D-NC), Walker (R-NC), and McHenry (R-NC). The IPRC’s outreach materials, which highlight evidence-based information related to injury and violence prevention, have assisted policy-makers in developing and considering potential legislation regarding opioid overdose prevention, motorcycle helmet laws, fireworks sales, driver licensing, and return to play following concussion. InjuryFreeNC.org is North Carolina’s unified voice for injury prevention. The website includes up-to-date information related to preventing injuries and violence in NC, access to experts, and ways to connect with the injury prevention community that works to keep NC safe. UNC Healthy Solutions provides capacity-building support to projects seeking to change the health of populations by preventing injury, violence, and chronic disease. The team translates evidence-based methods for communities and tribes. The IPRC currently supports the UNC Healthy Solutions Team in their work with the Indian Health Services Injury Prevention Program. Learn more about our work with the UNC Healthy Solutions team here. The IPRC’s Training and Education Core includes collaborative training programs informed by the needs and perspectives of injury and violence (IVP) practitioners –providing education, mentoring, and training programs that inspire and educate IVP practitioners and researchers. 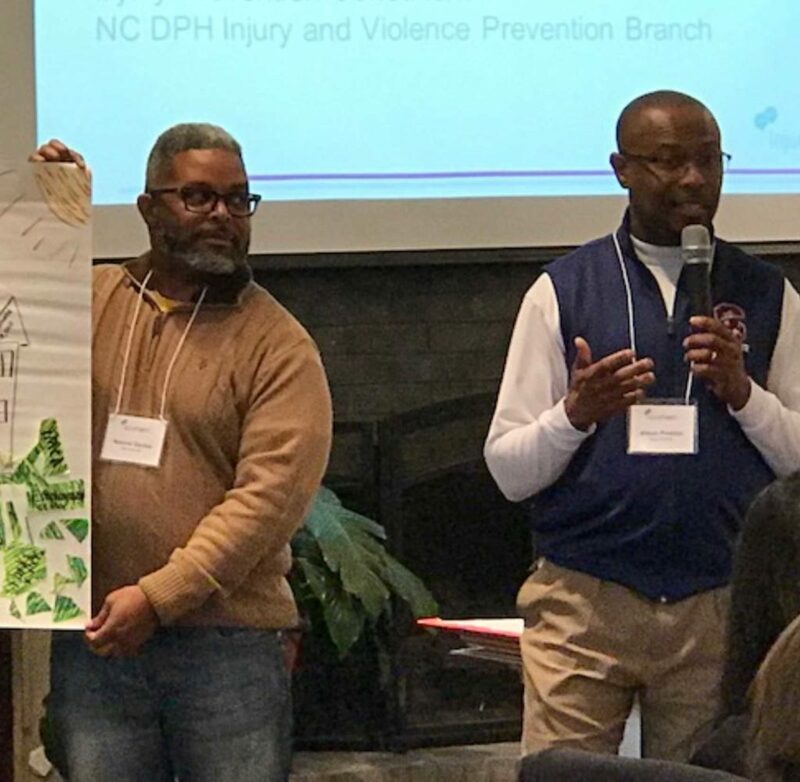 Created in 2012, the Injury-Free NC Academy trains teams of diverse community stakeholders in injury and violence prevention (IVP), building community-level capacity for the organizations to implement and sustain initiatives to reduce injury and violence in their communities. The Academy is designed to provide public health practitioners with injury topic-specific content and key skills (e.g., coalition building, community programming, and logic model building) that enable them to implement evidence-based interventions in their communities. Each year, Injury-Free NC Academy solicits teams of IVP practitioners from across organizations and disciplines to participate in two 2-day trainings, with coaching, technical assistance, and follow-up support to help the teams apply what they learned in the Academy. Given the decades-long relationship between the IPRC and the North Carolina Department of Health and Human Services, Division of Public Health, Injury and Violence Prevention Branch (NC IVPB), and the expertise housed within each, the two organizations are a natural fit to deliver these comprehensive training programs through the Injury-Free NC Academy and partner on Academy oversight and governance. Our Seminars, Symposia, and Speakers Series take place on the UNC campus and throughout the state and include UNC-affiliated researchers, visiting lecturers, and subject-matter experts. These events provide a forum for researchers, practitioners, advocates, and policy staff to connect around various injury and violence prevention topics. Learn more about our Patricia F. Waller Annual Lecture here. Visit our Events page to learn more about past and upcoming seminars, symposia, and speakers series. The IPRC supports two courses in IVP that are taught in the Gillings School of Global Public Health. These courses focus on unintentional injuries from a public health perspective and intentional injuries (violence) using similar perspectives and concepts. Concepts covered in these courses includes the Haddon Matrix and the Haddon Countermeasures, active and passive prevention strategies, using framing concepts for communication and messaging, community-based injury prevention strategies and capacity building, and injury surveillance. In-depth class sessions address a range of injury/violence topics in detail, and the material is taught using a combination of lectures, classroom discussion, readings, and project work. This course examines the causes and consequences of injury, predominantly unintentional injury, through the use of interactive classroom exercises and seminars led by experts in injury control. The course covers core concepts in injury prevention and control, including the epidemiology of unintentional injury, prevention strategies, behavioral models, messaging framing, the Haddon Matrix and Countermeasures, and strategic community-driven injury prevention. Detailed information is presented on a range of substantive topics in unintentional injury, including opioid disorders and overdose, falls in older adults, occupational injuries, burns and thermal injuries, agricultural injuries, musculoskeletal and sports-related injuries, and motor vehicle, pedestrian, and bicycle injuries. Prevention of unintentional injuries in both domestic (USA) and global settings is discussed. This companion course examines the causes and consequences of violence (intentional injury). The course covers the epidemiology of violence, causes and consequences of violence, structural determinants of violence, community-based violence prevention strategies, and violence surveillance. We also discuss a range of substantive topics in intentional injury, including child maltreatment, gender-based violence, suicide and self-harm, and firearm-related violence. This is an exciting opportunity for masters and doctoral students from diverse academic, professional, and demographic backgrounds to gain hands-on experience in IVP, including skills in a broad range of methodological approaches for IVP-related research, programs, and policy design; and translating research to practice for policymakers, health care providers, community organizations, and other partners in IVP. Applications are now being accepted for the 2019-2020 application cycle. Learn more about how to apply.